Can Replacing a Cabin Filter on a Regular Interval Help to Extend the Life of the Air Conditioning and Heater Components? Cabin filters prevent harmful dirt and debris from entering your vehicle’s interior. But did you know they also protect your car’s heating, ventilation, and air conditioning (HVAC) system? 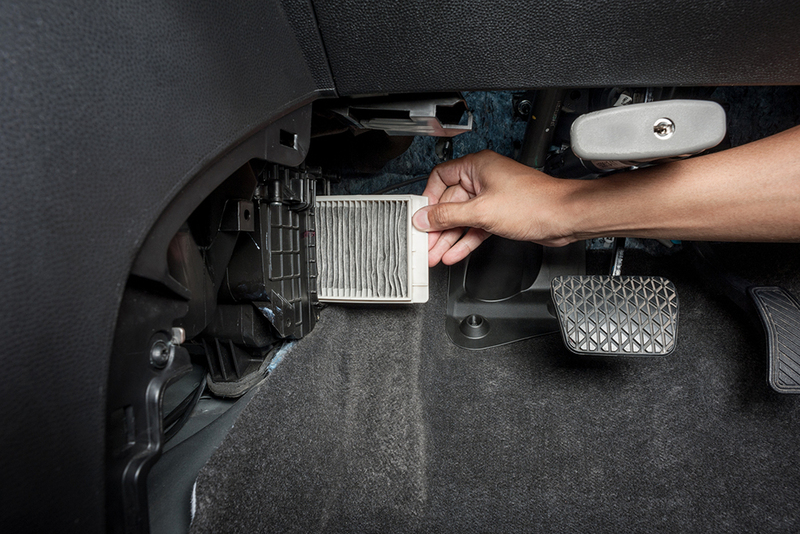 Cabin filters are nearly as important to your vehicle’s health as they are to your own. The cabin filter is a simple way of protecting – not only your lungs – but your vehicle’s HVAC components. Most cabin filters have a pleated paper filtering element mounted to a plastic frame. Contaminants get trapped in the element before they enter the vehicle’s HVAC system and interior. There are two basic types of cabin filters: particulate and activated charcoal. Particulate filters trap dust and debris. Activated charcoal filters do that too, while also absorbing fumes and odors. Both filter types are capable of providing protection for the HVAC system. Even though we take heat and A/C for granted, the HVAC system is quite complex. Heated or cooled air must pass through a maze of tubes and ducts before it reaches the interior. The cabin filter is placed at the beginning of this maze, in the HVAC system’s air intake. Outside air gets pulled into the system by the blower motor. That air passes through the cabin filter before it reaches the interior – or any of the HVAC system components. The blower motor, heater core and A/C evaporator are all protected by the cabin filter. It traps dust, dirt, and pollen before they can contaminate these vital (and often expensive) HVAC parts. This improves HVAC performance and extends component life. Over time, the cabin filter becomes clogged with pollutants. When this happens, it blocks airflow into the HVAC system. As a result, the HVAC system has to work harder to heat and cool the cabin. For example, the blower motor may have to be run longer, or be set on a higher setting, to pull in enough air. This extreme use shortens component life. In some cases, a filter that is severely restricted can also allow contaminants to enter the HVAC system. The blower motor may pull dirt and debris from the over-saturated filter, sending it directly into the evaporator and heater core. This can clog and damage these critical HVAC components. For these reasons, regular cabin filter replacement is essential for HVAC system health. Typically, charcoal filter replacement should be done once a year, or every 15,000 miles. Particulate filters are generally replaced every 30,000 miles. Both filter types should be changed more frequently on vehicles that are driven in dirty, dusty, or high-pollution areas. Not all cabin filters are created equal. Some cut-rate filters don’t trap enough contaminants to be effective. When you choose Premium Guard cabin filters, you’re guaranteed the best performance. Premium Guard cabin filters trap up to 99% of airborne contaminants to protect your HVAC system. Consider the cost of replacing a evaporator or heater core – you’ll quickly realize a high-quality cabin filter is a must.